i took donkey into Aimee’s work during her department’s Christmas lunch. we had a little trouble getting on the network, all were either secured with EAP-TLS or browser login & terms-acceptance pages. there are ways to make this work, and so we’ll get it going eventually. for the time being we just setup a laptop’s WiFi as an ad-hoc network and bridged that with the laptop’s wired LAN connection. i put together a demo video of the Beta functionality before i handed him over. so there are some bugs, and there’s already feature requests that i never anticipated, but donkey has to find a place in the world sometime. Willie (one of the architects there) suggested we put the source up on GitHub instead of just the blog, so we’ll get that done in the next couple weeks. i’m sure there is at least something in the Actionscript 2.0, Java, or shell scripts that someone will find useful. in the next post, i’ll link to the source code, do a walk-through of the project architecture, and discuss what challenges i encountered. this project has been a great learning experience! it’s put me back in touch with some technologies that i hadn’t messed with in years, and opened my eyes to some completely new things as well. 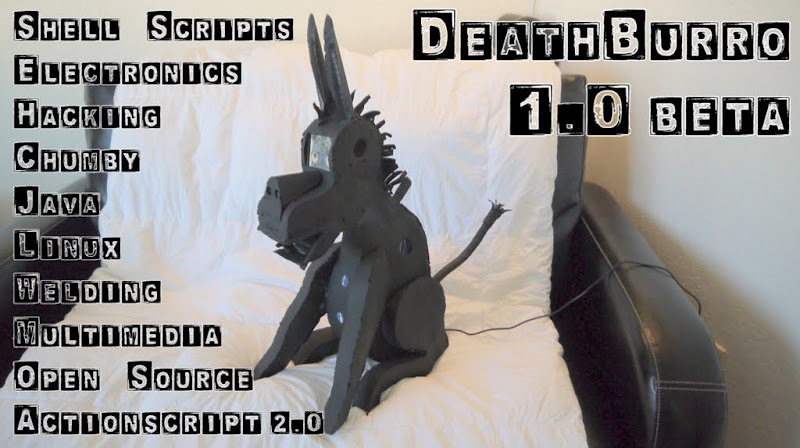 I still think DeathBurro looks like a donkified Hannibal Lecter.